In 2010 I had to figure out what faith looked like so I could paint it. I was creating a series of paintings inspired by the life of St. Nicholas for a church of the same name. While summarizing my research the word faith kept coming back to describe how St. Nicholas lived his life. I couldn't get around faith so I had to dive into it. I now teach the method I used to find my image and I call it The Devotional Art Process. I still practice this process when I am trying to create an artwork to help me understand Biblical truths, solidify important life lessons learned, or remember things I don’t want to forget. I think you'll find this method useful if you too are trying to come up with an original work of art that will communicate more than a mere representation of things that already exists. 1. Ask God for help. Whenever I begin a new task I say, “Here I am God, use me.” In this way, I am inviting the divine to reveal what he will to me. I am letting inspiration know that I am sitting down to work and it may visit me any time, the sooner the better! How would I explain this to a non-native English speaker? What was I taught by my school, parents, friends, or church? Have I already seen a painting or photograph that communicates this? Music – Songs containing the concept in the lyrics or mood. Do I know someone like this? Opposite to this? What would this smell, taste, sound or feel like? Biblegatway.com word search - you’d be surprised what you can learn here from this ancient text! 3. Based on what gathered information, what image would most clearly capture this idea? What image can I actually produce that will capture this idea? Write a description, sketch, or photograph the concepts that come to you. Talk to useful people about your ideas. 4. Create the final image. 5. Share the final image with others and receive feedback. 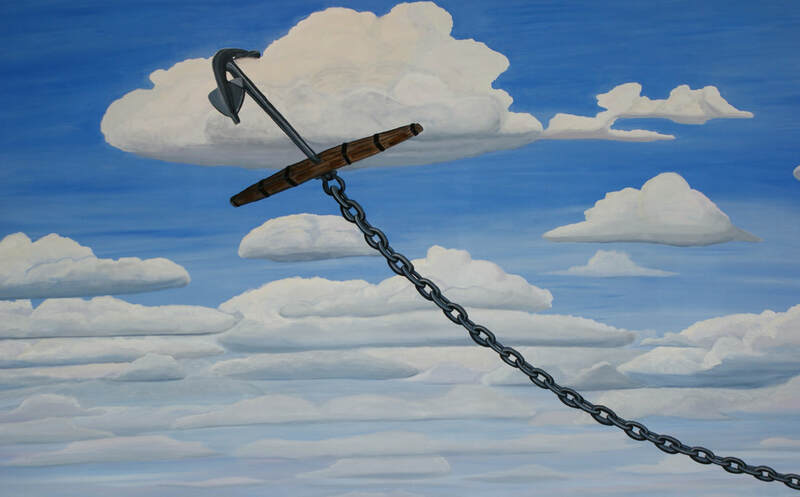 In my “Faith” painting (pictured above), you see an anchor firmly caught in a cloud to represent St. Nicholas’ faith pointing others to God. I decided on this image because you can't really see "faith", you feel it. It made me think of boating. You can’t see if your anchor is holding onto anything under the water but you can feel it’s found something to hold because you don’t drift away with the tide or current. Likewise, when believers cast the anchor of their faith into the heavens, they learn that God holds them steady through the currents and tides of life. Every art teacher has their own opinion on the subject of art supplies, but I'll tell you what has worked well for me. 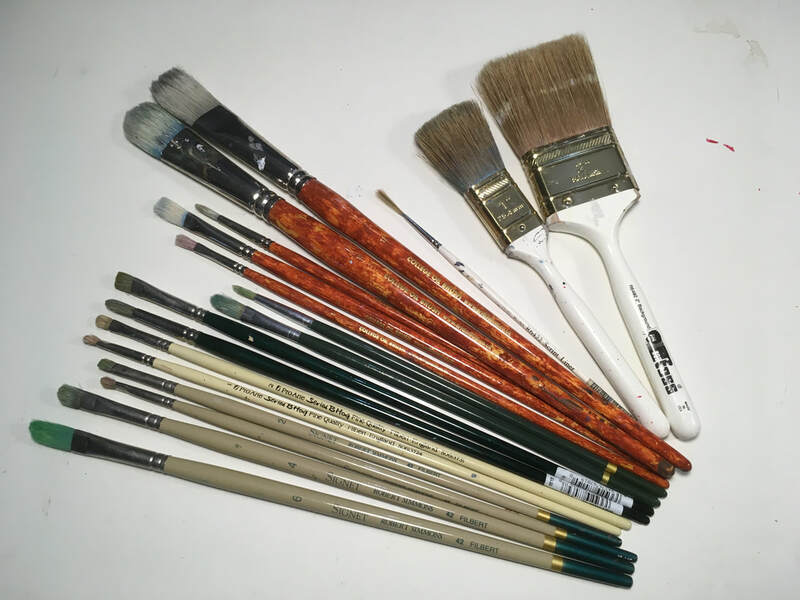 I like to begin with what I already have on hand and so I started my first oil painting class with one of those gift box sets of oil paints and brushes and a Bob Ross paint kit. Those two kits served me well until I knew enough to choose new supplies for myself. ***Gloves and Low Odor Thinner - I am allergic/sensitive to everything so I prefer to use Low Odor Thinner in place of turpentine and wear disposable gloves when I paint with oils. It's also a good idea to wear gloves when using Flake White paint which contains lead. (We know lead is what made artists crazy back in the day and let's face it, we're crazy enough these days without assistance). 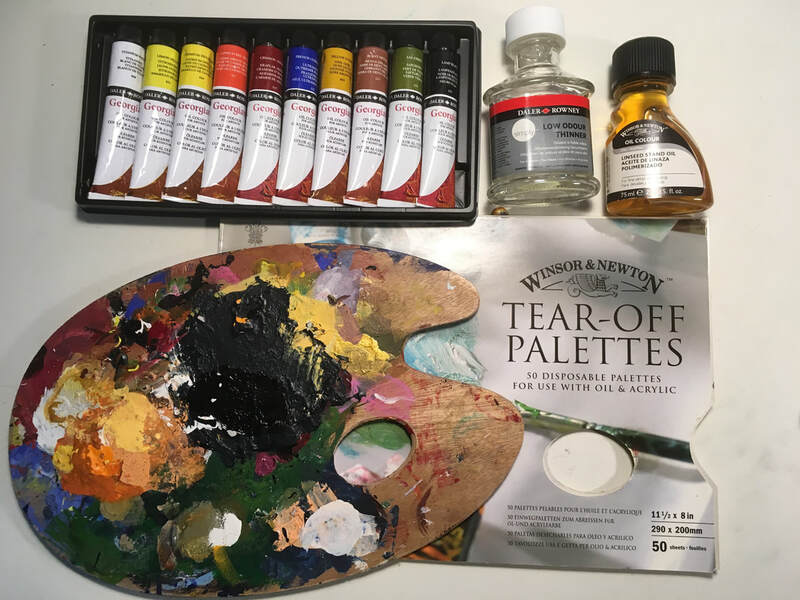 When purchasing oil paints, I recommend Winsor & Newton or Daler Rowney brand because they are affordable and have a great range of colors. When trying a new color, purchase a small tube (22ml) in case you don’t like it. Buy large tubes to replace colors as you run out of them. It's good to have a variety of warm and cool colors and you will learn that certain colors are transparent (Ivory Black) while others are more opaque (Flake White). Oil painting takes some time to perfect, but the color richness makes it well worth it. Unlike acrylic and water color painting, oil paints are slow to dry. When living in England I had to wait a full week between layers of paint. You may be thinking what do you mean layers of paint? That's the magic of oil painting, around layer three, the layers of color begin to show through each other creating a beautiful depth and richness. Oil painting is one medium where I suggest you must get a book from the library or take a class. There are so many tips and tricks and ways of using this medium. One tip I learned in class that I'll share with you involves acrylic paint of all things. It was a one day class painting in the tradition of the Old Masters and he had us begin by painting a greyscale version of the still-life using acrylic black and white. After we completed the black and white acrylic painting, which dries in minutes, we began adding layers of colored glazes over the oranges, bananas and plums. It was like magic as we placed the color and added highlights! So, if you're in a hurry, like me, consider an acrylic underpainting. But, you must never paint acrylic over an oil painting because the acrylic (which is water based paint) will not adhere to the oil (which is oil based paint). You know what they say about oil and water repelling each other! O>-< See, I just did it using a keyboard. You might even say the person is lying down. But, you wouldn’t say it looks like anyone you know. It’s a symbol for person. Our brains are full of symbols for trees, flowers, rainbows and many other things that allow us to draw quickly when playing Pictionary and get the desired answer. But, these symbols are unsatisfying when we are trying to achieve the likeness of a family member. So, how does one get to the point of drawing things as they look to the critical mind? Here are some tips to get you moving in the right direction. #1: Work from photographs you’ve taken. From my experience, realism requires drawing from the real thing. I’ve been drawing off and on my entire life and I cannot whip out a realistic anything from my mind. I can make some cute cartoons or caricatures, and I’m an excellent Pictionary partner, but, if you want realism from me I need to be in front of the thing; or, better yet, a photograph. Photographs are helpful when learning because they can’t blink or move out of place and the lighting won’t change with the movement of the sun. The photograph also does the hard work of translating the 3-D object into a 2-D form. #2: Draw on a large sheet of paper . Trust me, you do not want to draw a full length portrait in a 4”x6” journal. You would need the steadiness of a surgeon to place every mark where it needs to be. I once did a small pencil drawing of my daughter and she looked crazy in the 6” x 9” sketch. I kept looking and looking trying to see what I did wrong. I had to erase the corner of her eye and draw the corner with one pencil dot. With one dab of the pencil it was perfect, but, I had to remove the dash that was wrong so I could place the dot to get it right. A DOT! Larger formats are more forgiving and provide more room for error. #3: Spend more time looking at the subject than your drawing. Don’t dive into drawing right away. Sit there and really look at what you’re drawing for a minimum of 5 minutes. Set a timer. Spend that time tracing every line you see using your imagination. Where are the darkest darks and the lightest lights? Is this composition short and wide or tall and thin? Plan how you will put it on the paper: horizontal or vertical? Will you use a 2B or 6B pencil to draw a baby? What part of the image do you want at the center of your paper? What do you like most about what you’re looking at? Don’t lose that! What is in front and what fades into the background? Really map out the drawing in your mind. #4: Realism requires questions, corrections, erasers, and rulers. For realism to blossom, your perspective lines must be spot on, your horizon needs to be level, the walls of your house need to be straight, and the person’s face must be in proportion to itself. Break out your library card and check out books on perspective, proportions, and drawing realistic faces. Erase errant marks and straighten wavy lines. You must keep looking at the original and compare it with the marks you just put on the paper. Does your line have the same slope? Correct it. Is the house really taller than the tree? Yes, it is a newly planted tree. Reassure yourself because your brain might try to make the tree to tall. #5: Draw something, or someone, to whom you aren’t emotionally connected. We are often unsatisfied with subjects we know very well because we are experts on the subject and emotions can complicate things. Our logical brain says, "Something isn't quite right with this drawing.” Our pet can look like a stuffed animal instead of the warm, charming critter we know them to be. While you are learning to draw more realistically, maybe avoid friends, family and pets for subjects. #6: Practice and patience lead to improvement, not perfection. As you practice drawing you are building your visual vocabulary of how you create various 3-D objects on a 2-D surface. You will never be as perfect as a camera because you are not a piece of machinery. But, with enough practice you just might trick the human eye. Artists are playing an instrument that requires practice and tuning. Just like musicians, artists must practice 8 hours a day to perfect their performance. But even musicians who play a piece perfectly as written, can sound a little different. That’s the magic of humans and snowflakes, no two alike. Artists put a bit of themselves on the paper and that’s okay, even in realism. It takes patience and persistence to achieve a realistic replication of an image and the artist must push through the moment when they most want to quit because that is often the moment they are on the verge of a breakthrough. Remember, what you draw tomorrow will be better than what you drew today because you never stop learning and improving. Why this painting in ArtPrize? A student from my alma mater was writing an article for the Chimes about Calvin Alumni who entered ArtPrize this year and saw my name listed on Calvin’s website. She asked me to answer the following three questions; and, although I didn’t get back to her in time for her publication deadline I thought I’d share my answers with you. -How did Calvin College impact your journey as an artist? My Calvin education taught me to care for our culture and contribute to the redeeming work Christ is doing in my sphere of influence. I take that charge seriously and hope it informs my work. On a practical level, photography and graphic design classes I took really inform my process as an artist. -What inspired this installation and what is your hope for how the public interacts with it? I was deeply touched by the #MeToo movement and the number of people it has affected. A few years ago I drew the image of a woman on a pier tied to a barge of trash for a friend. She was sexually abused as a child and this was an image that came to her in her healing process. The meaning, she discovered, was that she should forgive her grandfather and let go of those memories so she could move forward in freedom and not have those past events define her. It didn't matter who put the rope around her neck, she could take it off. She suggested the image could be improved if I painted my own trash and what freedom would look like for me. I was not eager to undertake this project and was avoiding it until I saw a Facebook video on forgiveness that gave me the title for my painting. I realized art could begin a journey for others who need to find healing for their past through forgiveness. They may not find justice, but they can find freedom. On my website I have links to many tools for working out forgiveness that I've come across since undertaking this project. 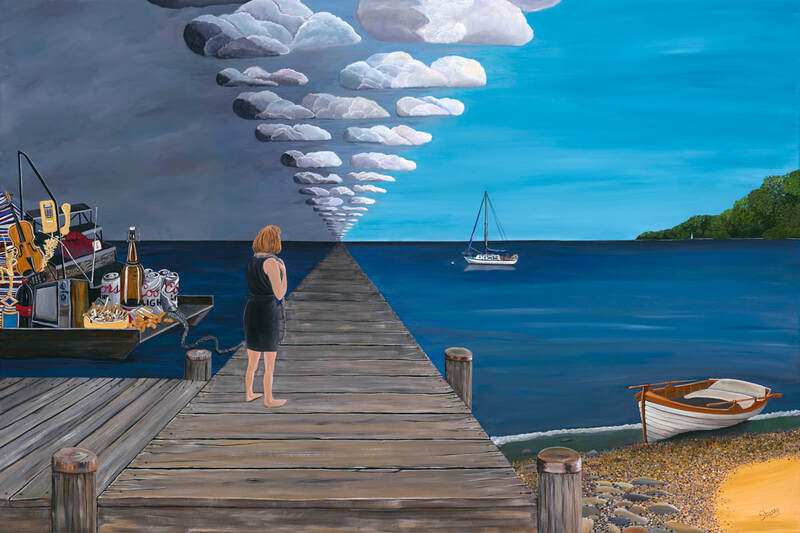 My hope is that this painting will provide a way forward for those who are still held hostage to painful memories tied to them by un-forgiveness. -Have you entered anything in ArtPrize before? This is my first year participating in ArtPrize. I chose to enter ArtPrize so that this painting might contribute to the conversation around #MeToo in our country. These problems won't be solved in the courts or legislature; but, by individuals taking courageous steps to heal their fractured identity. Keep your digital image files secure in 3 different locations ensuring at least one is at a different location. Examples of suitable back up locations include phone, laptop, cloud storage, mirror drive or RAID. Cloud services and external drives are examples of backups that can be stored off site. Cloud storage brand name examples: iCloud, Google Drive, Dropbox, Amazon Web Services, Backblaze. External drive brand name examples: Hitachi, SeaGate, Western Digital. Search online and read reviews for the most reliable back up devices and secure cloud storage. Be sure to replace back up drives once the warranty has passed and pay for those warranties. Avoid reliance on memory cards. Memory cards and USB sticks are easily corrupted. Be sure to remove images from cards ASAP. Try to automate backup by using Time Machine or Windows File History. Save only the best version of your image as a master (highest resolution). Avoid duplicates. There are apps to help find and remove duplicates, use them. Examples: Gemini, Better File Rename, Photo Mechanic, Adobe Bridge. Naming files. Do not use # ? / \ ) ( ‘ ; “ : @ * & > < % $ or spaces because these special characters can ruin searches and cause corruptions. Use _ and - in file names. Look your best online. Upload a good quality .jpg. 920 x 1080 dpi is a standard image size though some platforms may compress smaller. If you post it online it may be stolen. It is a chance we take to gain recognition of our work online. The more you share your work the more interest there can be in your work. Use social platforms to share your images. Examples: Instagram, FaceBook, Etsy, Websites. It’s important to protect acrylic paintings you like by varnishing or framing them behind glass. Acrylic paintings can get dirty like any other plastic object in your house, imagine an exploding soda or great-aunt Edna smoking. A proper varnishing is the most cost effective solution for large canvas paintings. I recently varnished a 4’ x 6’ acrylic painting and thought I’d share what I learned. Let it be known, there is the right way to do things and then there is your way to do things. You have to do what works for you, your space, and your budget. Disclaimer: Always follow manufacturer’s directions, even if I don’t. Clean container to mix gloss and varnishes. I use small, shallow glass salsa jars with lids. I mix things up the day before and let them sit to allow air bubbles to clear. Measuring cup. I use a medicine cup that came with liquid benadryl because a little varnish goes a long way. I tend to mix 2 Tbsp gloss medium to 1 Tbsp water at a time. 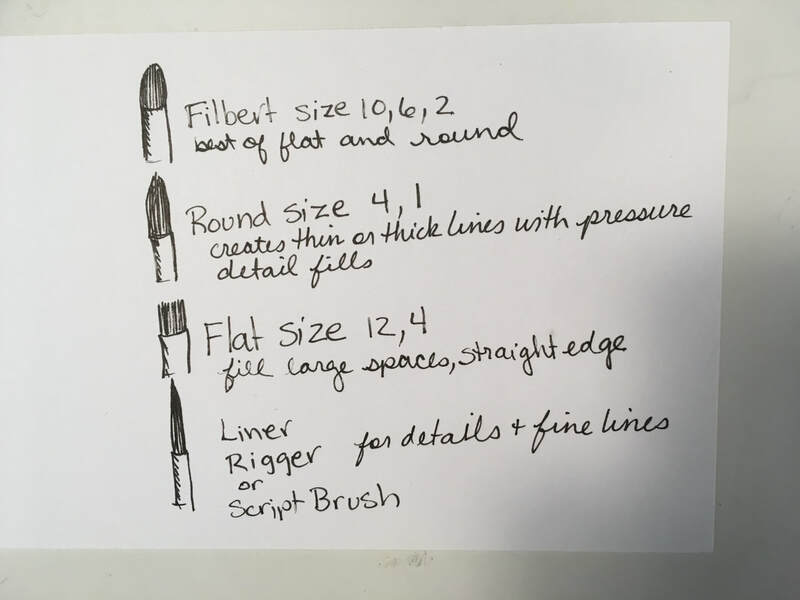 Brushes: I like using a 3” foam brush ($3) or 3” flat Redline brush by Princeton ($35). Golden doesn’t like you to use foam with their products but I like how it handles. You can use cheaper paint brushes, but the Princeton brush was the only one that didn’t make me want to curse. Stir stick. I use a pallet knife or popsicle stick. 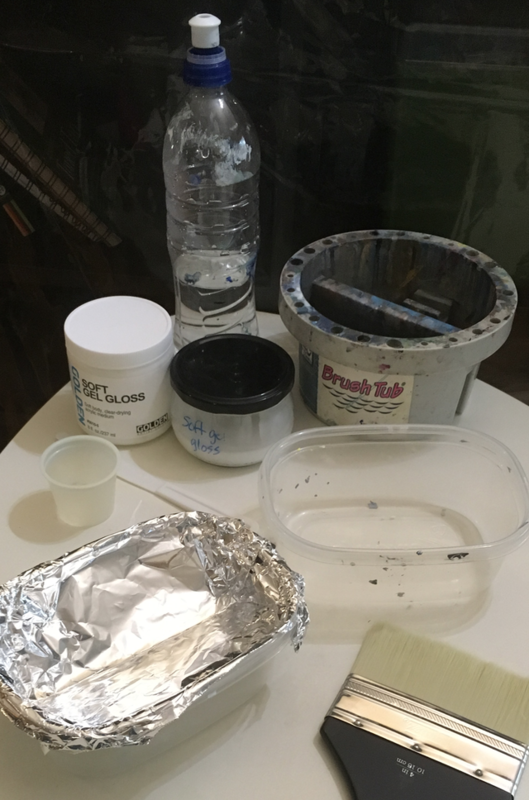 I make a special aluminum foil thing to pour my gloss medium and varnish in while painting (see photo). I saw this trick on YouTube and LOVE it. Less product is wasted and you get just the right amount of varnish on your brush each time. Cut a piece of foil to fit a shallow container. I use a container lunch meat came in because my 3” brush fits it nicely. Fold your foil in half length wise and crease the bottom. I then fold the sides over to fit in my container so I have a rectangle of foil. Open up the foil rectangle, place the crease towards the bottom of the container and then wrap edges of foil around edges of container maintaining your crease in the bottom so you have a V shape inside. Pour in a little medium and add more as needed. When I am finished that session of varnishing I throw away the foil and make a new one each time. Sorry planet earth! Allow the painting to cure before varnishing. Depending on environmental factors an acrylic painting will cure in 36 hours to a week. Lay the painting flat. I have varnished paintings on the easel in the past, but apparently, that’s not best practice. Ensure the artwork is dust and lint free. I use an eyeglass lint free cloth to wipe my painting. I also put vent filters over the air supply vents in my art room to help catch dust and lint. In March I got the idea for a painting that I thought might land a spot in Art Prize. I started work immediately because I have to convince someone that this painting is awesome before June 28th so I can be part of the show in September. So, every day I plug away at the painting and each day it looks more awesome. I can easily pass a day lost in the joy of the minutia of the painting. Don’t get me wrong there are other times when I have to walk away because something isn’t working and I'm frustrated, but that’s what happens when you’re creating something that doesn’t yet exist. It takes time to figure out this world and its conventions. It amazes me how my brain seems always to be working the painting in the back of my mind as I do other things. Suddenly in the middle of making dinner I’ll get an idea for how to fix something and then I can’t wait to get a paint brush in my hand and see if I’ve actually solved my problem. This painting is definitely testing me. It's exhausting working as a slave with or without inspiration. I like the instant gratification of drawing and really haven’t painted anything this big and detailed and personal…well…ever. I find myself hearing in my mind the advice I often give my students….keep adding information, add shadows and highlights, add the next level of detail. Don’t give up, the more information you add the more the painting will make sense and come alive. Sure enough, while a sand beach will do, I’ve learned that a pebble beach is magnificent. While a vague impressionist style contains all the necessary information, realism can be a more powerful communicator. It's okay that no part of the painting is finished until the entire painting is finished. Tweaks are necessary to keep large paintings cohesive. It’s exhausting infusing a painting with yourself and your experiences, but the painting takes on a new level of believability, intimacy, and power when we’re brave. So, I’m afraid my blog and instructional You Tube videos will necessarily be interrupted by Mad Scientist moments. As an artist, I am a slave to inspiration when it comes and calls my name. I must answer. If I don’t, inspiration will leave me and find someone else to bring it to life. So, I beg your patience as I pour my heart and soul on a canvas and try to capture for you to see what inspiration has whispered in my ear. Once the painting is finished, I will return to blogging and YouTubing, hair and makeup, cooking and cleaning and lunches with friends. Until then, I'm in a different kind of good place. I hope you too will listen for, and surrender to, inspiration in your life and see where it leads. Art Group met at my house last night. I love my art group. There are six of us who get together to paint, draw, and just talk about our lives nearly every week of the year. Sounds perfect doesn't it. To be honest, I never want to go to art group, or host art group, even though I love art group. I'm lazy, we meet at night, and I just want to be in my pajamas and go to sleep at night because I'm really not my best self at night; but, once we're together there is no other place I'd rather be. The Newcomer's Art Club in Oxford, England really saved my sanity in so many ways for those years I lived abroad. Having someone who's glad to see you every week is important. Some people don't have the luxury of getting together with friends to paint. Many schools across the country are cutting art programs all together. I've been thinking about how I can help those who long to be creative but don't know how to go it alone, maybe expatriates in a foreign country, or who live in a rural community, or for one reason or another don't have friends to paint with or access to friendly, non-competitive instruction. So, I've started a YouTube channel. It's nothing fancy, just me teaching you how to do some art that I'm interested in and giving you tips and tricks along the way. I know I'm not really there with you, but I hope it feels like you have a friendly, encouraging artist friend in me who will help you try new things, cheer you along the way, and answer any questions you have about art. If you like me or love me please subscribe to my YouTube channel so that it will become more findable for the people who need it most. Thanks for all the support you give me friends! I appreciate you. The truth is, “Not much.” I think many artistically inclined people never get started painting because they think, “I don’t have the space, time, or money to paint.” But, that’s just wrong thinking. Instead they should think, “What do I already have that I can use?” Once started, they will find the time they spend learning to paint flies by blissfully. Jane Austen wrote her novels at a desk no bigger than a side table with ink, pen, and paper. I have painted on my lap while perched on some uncomfortable rocks in the fog. Go through your house, see what art supplies you already have, open up a TV tray table and get started. Recently, I went to the beach with my son for some impromptu fishing and muscle harvesting. I intended to paint the landscape if the tide was high, so I grabbed a few things on my way out the door. Now, I’m an artist with hundreds of dollars worth of supplies ready to go, but my daughter snagged my favorite water color paint set. (I would complain about the theft except that she uses them more than I do and makes beautiful water color paintings). 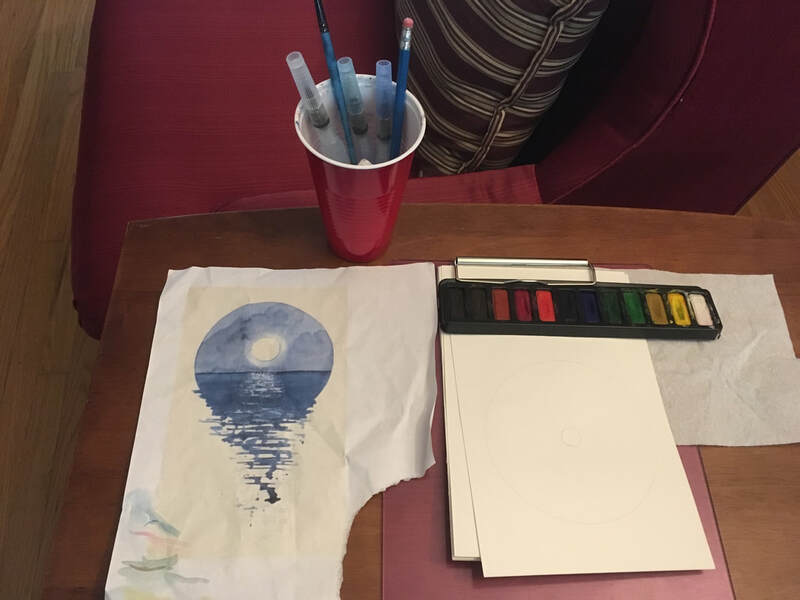 So, I was left to grab paints from a water color paint by number my daughter received years ago, 4 half sheets of left over 9”x12” water color paper, an acrylic clip board, plastic cup, pencil, 2 paper towels, 2 paint brushes and 3 water color pens. I totally forgot a pallet for mixing colors. Oh well. It was slightly overcast at the beach, which is great in California so you don’t go blind as an artist, and the tide was high so I found a rock and set out to start painting. For some strange reason, a bank of fog rolled in from the ocean so thick I could not see where my car was parked about 30 feet away. So, much for practicing landscape today. I rummaged around in my bag and found an image I printed out from Pinterest. I remember being frustrated because the original site was no longer up so I couldn’t find any instructions for how they created the image, but I liked it enough to print it out anyway and use it for inspiration. 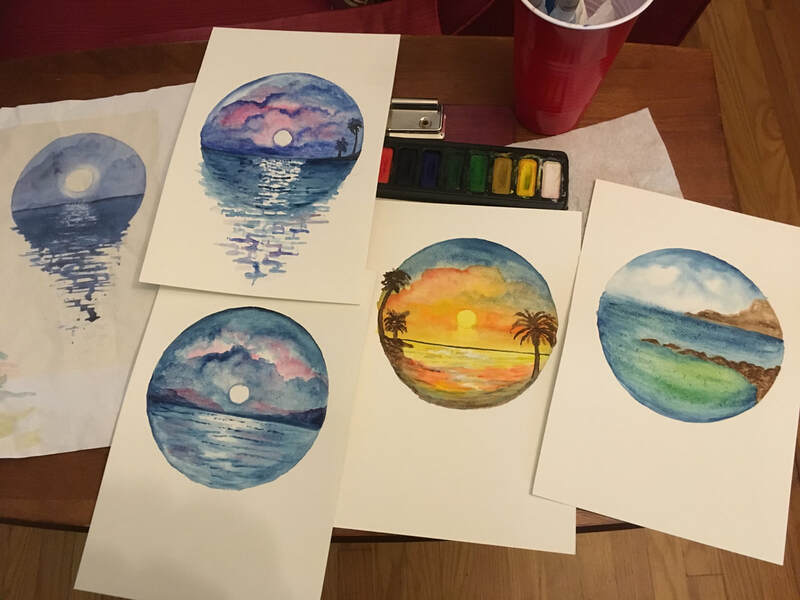 Well, I grabbed a CD from my car and ta-da I cranked out 4 paintings. Once the fog cleared out I was able to use the local landscape for inspiration to make the Pinterest artist’s idea my own. Can you tell which paintings I created during the fog and which ones I painted once the fog lifted. LOL. That's real life right there. Lesson learned: You don’t need everything to be just right to create beautiful art. You just have to be present to the moment and use the supplies at hand. Don’t make excuses for why you can’t make art like, "The fog rolled in." You’re an artist. Fact: if you're human you're a creator, even if you just create messes. Artists are perpetual problem solvers (rummage in your bag, car, wherever, MacGyver the situation). You've got this! Go paint. Sherry Barrett is an active artist who takes inspiration from great works of literature, historical figures, and wise people.